I was intrigued by the Center for Environmental Biology Internship because it would allow me to explore hands-on field research experience and to delve further into informal science education settings. As a freshman it had always been my dream to be a part of the CEB Internship and now I’m grateful to have reached that goal this year. I am most interested in ecological conservation and restoration efforts which is why my favorite projects have been Drought Net and the Greenhouse Re-landscaping project. Through these projects I have learned how to create effective research protocols, operate specialized equipment, work in teams, and collect and analyze data. 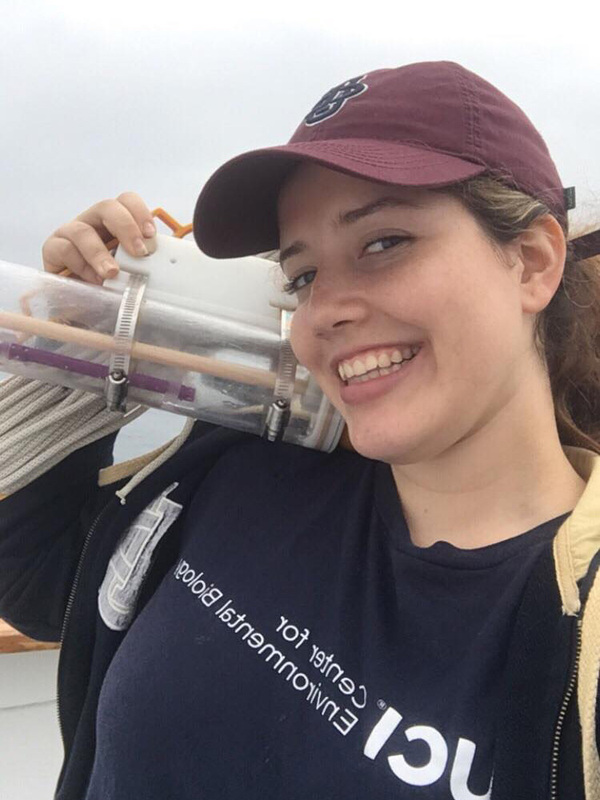 In addition, my other favorite aspect has been leading marine science cruises where I have improved my teaching and outreach skills through education programs with the public. In the future I hope to continue working in the environmental conservation and restoration field and inspire future generations to also care deeply about their environment and take action. The amount of problems we have within the protection of our environment can look to be so overwhelming, but I believe it’s the little work that we do here that makes the difference. 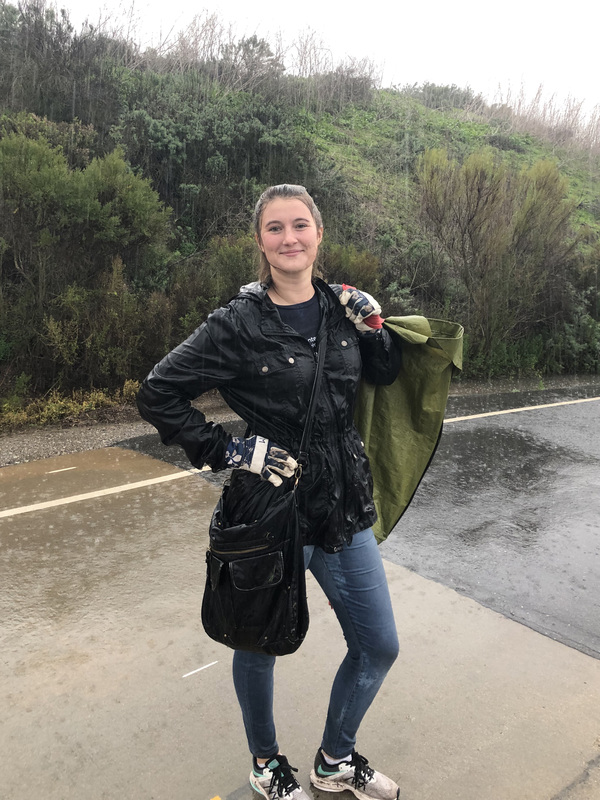 Interning with CEB has been a wonderful opportunity and I am so grateful to be able to work with local partners in restoration projects across Orange County! 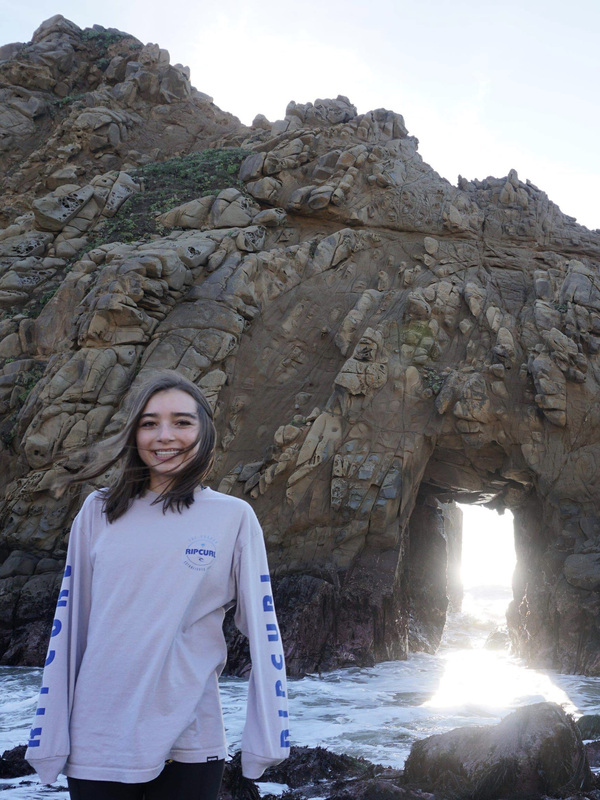 Each conservation effort and project is fueled by the passion of our community leaders, and it has been a humbling experience to work with extraordinary organizations such as Crystal Cove Conservancy and their Marine Protected Area Cruises. 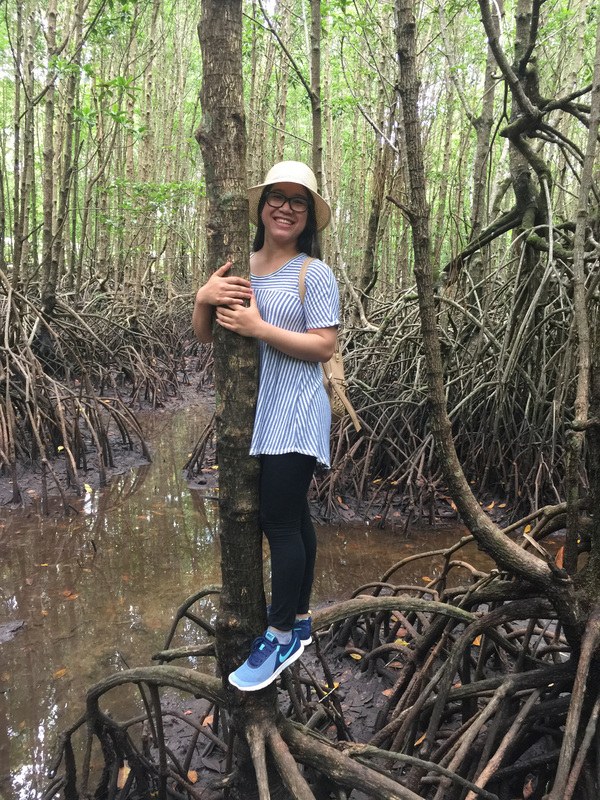 Being a CEB intern has led me to have thoughtful community engagements, contribute in experimental design, and become an environmental educator. Each experience in this program has been very rewarding. I think nothing compares to going out into nature and seeing the beauty of the natural world—the limitless sky, an imperial mountain– I have nothing but appreciation for these simple treasures and I find it important to preserve their beauty. Ultimately, I’d love to take the skills I’ve learned from this internship to continue the fight for healthy environments and a sustainable future. I’m a third year Biology major with a minor in History. My non-academic interests include karate, soccer and swimming! I joined CEB because I hope to become a veterinarian with a specialization in exotic animals. I believe that Ecology and Zoology are two sides of the same coin. Through this internship, I hope to gain knowledge about Ecology which will eventually help me become a more informed veterinarian who understands the intricate bond between nature and wildlife. I have had an opportunity to work on numerous research and outreach projects as a CEB intern. My favorite outreach project was helping high school students design their AP Environmental Science projects at Back Bay Science Center. I was also able to give them some advice about their college applications! Additionally, I have collected plant density data, soil moisture data, prepared seed bags, planted cactus and coastal sage scrub and helped design a study involving mulch. Through this internship, I have realized that I enjoy fieldwork and being outdoors much more than I enjoy traditional lab research. Additionally, I’ve gained important practical skills in designing experiments as well as collecting and analyzing data. I am grateful to CEB for the opportunity to grow and learn within this great program! The rural landscapes of my birthplace, Ukraine, nurtured my love for the outdoors at an early age. Now as a Californian, my love for the outdoors is fostered through my internship through the Center of Environmental Biology. 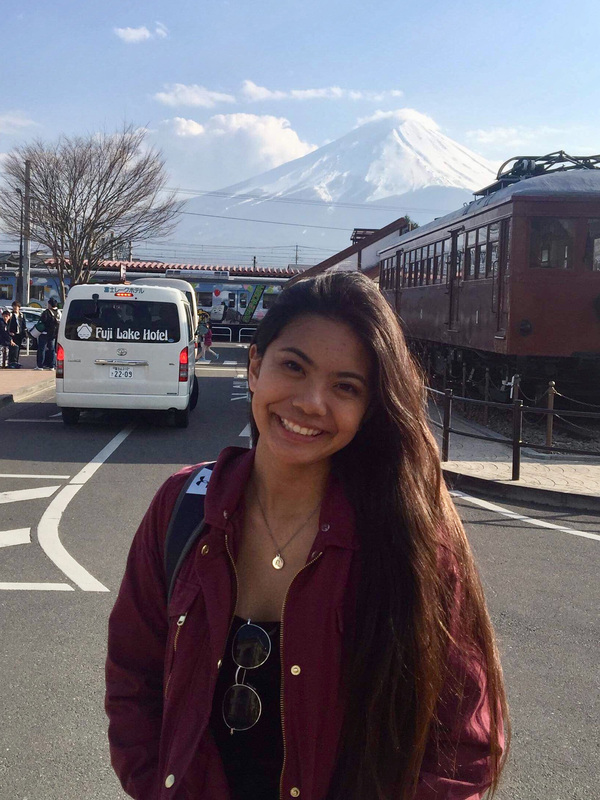 Through CEB I’ve been able to gain hands on experience in the field, explore a variety of local communities, and deepen relationships with colleagues. 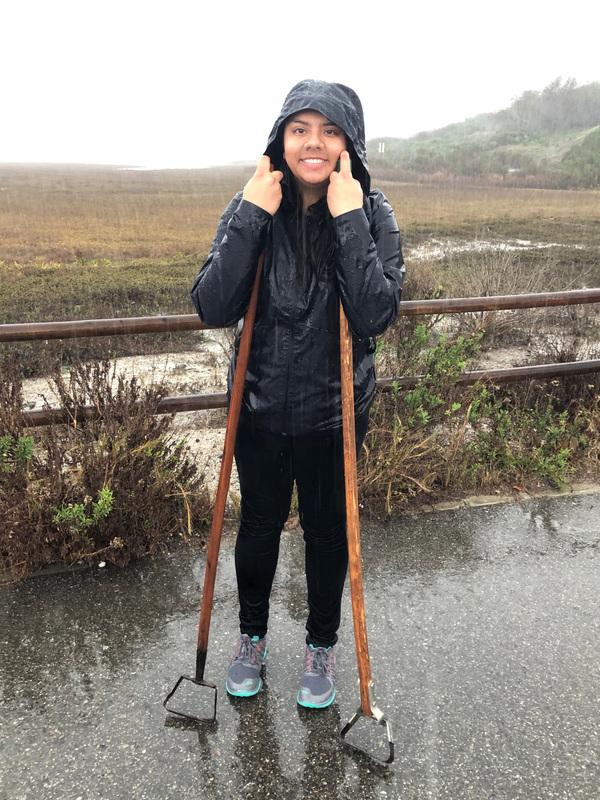 I feel honored to have had the opportunity to work with the Crystal Cove State Park, Newport Bay Conservancy, and Project Grow in a multitude of projects. These projects include Algerian Sea Lavender removal, a restoration study, and work with students. I have enjoyed sharing my knowledge with students and guiding them in the process of becoming field scientists. Every day I look forward to passing on what I know and learning something new. I hope to apply the knowledge I have learned to my future career, and to always remember the importance of protecting and restoring ecosystems. 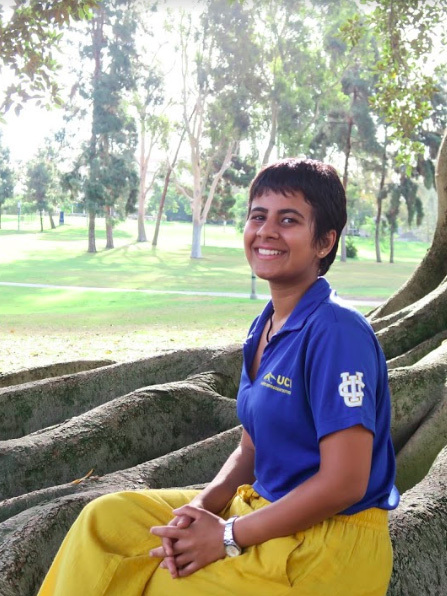 When I entered UCI as a first-year student, I was doubtful of the stories that upperclassmen would tell me about “finding my place on campus”. 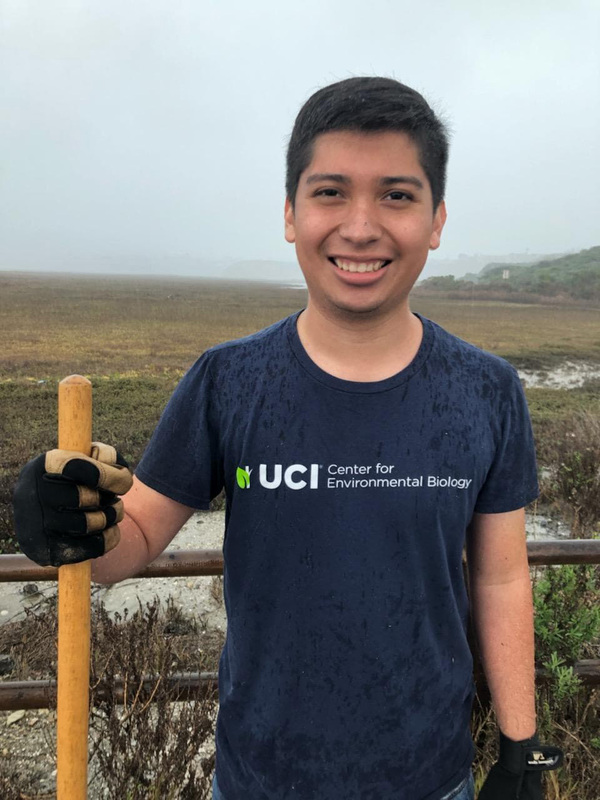 After my first year, I became an intern at the Center of Environmental Biology and I realized that I found my home at UCI. 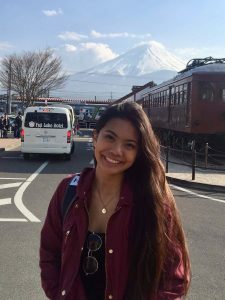 The CEB internship gave me an amazing opportunity to better myself in a multitude of ways. Working with the Back Bay Science Center helped me become a better leader in conservation education and a better educator for people, teaching them methods they can use to protect their community. I also participate in research projects that help me learn to be a better research scientist. The work I do with the CEB internship, both in and out of the field, is incredibly rewarding and is something that I will value for years to come. My fascination with the outdoors has transformed from mere admiration to a passion for conservation and restoration. The Center for Environmental Biology has taught me that education about and stewardship of our precious environment helps in undertaking its preservation. Through CEB, we have had the opportunity to play the role of educators, data collectors, and experimental designers; a very unique chance to experience the practicalities of several facets in the same field. Working alongside other students and community members who share my passion for environmental advocacy has made me feel utterly fulfilled and I cannot wait to see what the rest of the year with CEB holds in store. This is my second year as an intern for the Center for Environmental Biology. This internship has given me valuable skills in the field that I will be able to use in the professional field once I graduate. I’ve become more aware of restoration ecology and how it truly benefits the environment. I have become more confident in my ability to speak to the community about science and encourage them to be more active and aware of their environment. Within the internship, I am surrounded by a group of passionate people that share my love for the outdoors. We are able to feel truly connected by the experiences and lessons CEB has given us. CEB is such a unique program and I will be forever thankful for the experience and relationships it has given me. I look forward to the rest of the year and all of the amazing projects I get to participate in. As a 1st year student at UCI, I had many opportunities to take classes to learn about the dynamics of environmental change, especially with contemporary environmental issues. However, I desired tangible field work to apply the knowledge I learned as well as synthesize new ideas for bettering my surroundings. Interning at the UCI Center for Environmental Biology has given me the chance to work in the field on active projects that have immediate effects on the environment. 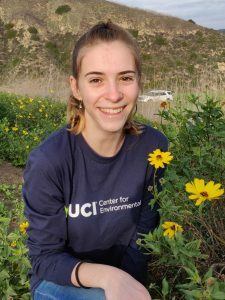 From educating the next generation of environmentalists to restoring local habitats across Orange County, this internship with the CEB has been an amazing and unique experience. Alongside the learning, I have also made many new friendships with like-minded peers and have built strong relationships with environmental groups partnered with UCI. My long term goal is to protect the environment through legislation and various other legal means. 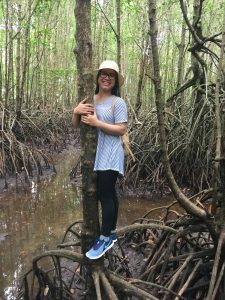 My internship with the CEB, although primarily research-based, gives me a strong foundation of the science behind environmental detriment which I believe is pivotal to the creation of environmentally protective policy. Being an intern with the CEB has been a wonderful experience. The internship has granted me many opportunities to learn and experience ecological restoration and conservation. I was able to practice and hone my research-based skills such as data collection in the field and data analysis in the lab. It was through this internship that I participated in a variety of projects that aim to tackle environmental issues found in California. I hope to continue making an effort in the environmental sustainability of our ecosystem, and to someday challenge climate change and pollution. Through this internship, I hope to gain the necessary knowledge and experience needed for a career in ecosystem management. Being an intern for the Center for Environmental Biology has given me the unique experience of working outdoors. The research that we do at CEB helps us learn about effective ways of restoring the environment while engaging the community and giving them the opportunity to learn about the natural world they live in. 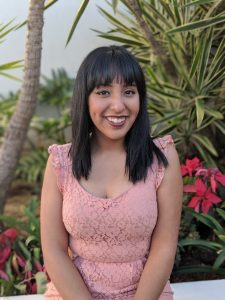 I have learned a lot from this internship from collecting and analyzing data, to designing experiments and contributing to the scientific community. As a returning intern, I have been able to share my experiences with the new interns and take on a leadership role. I have also been able to work on an independent research project and write a paper that will hopefully be published in the future. 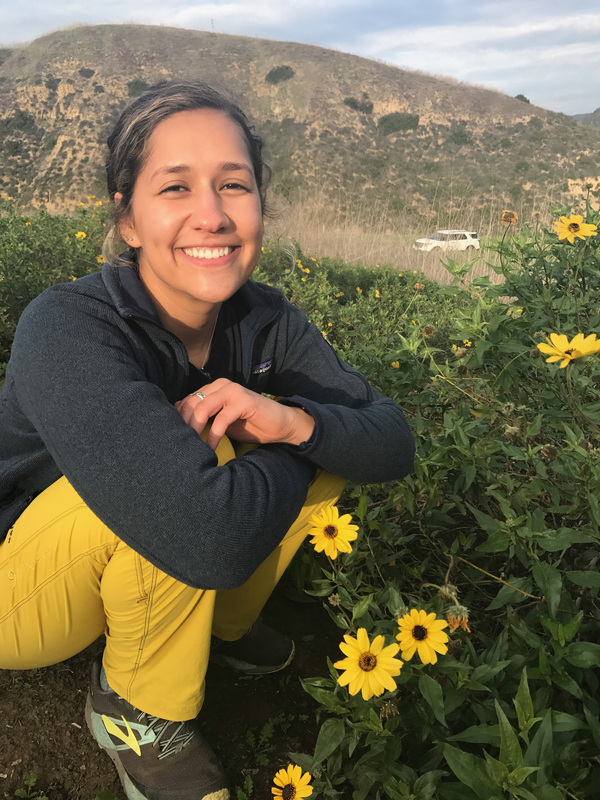 I am very excited for another year as a CEB intern and the opportunity to obtain the skills needed to pursue a career in conservation or science education. 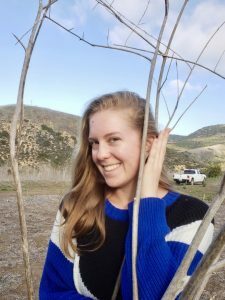 Being a student in the Environmental Science major, I was really interested in gaining a skill set of environmental work to help me prepare for my future career goal. The love of nature and passion for environmental conservation have driven me to search for this internship. CEB gave me a great opportunity to engage in both ecological research projects and environmental education outreach around Orange County. The possibility of going out to work in the field alongside others from multiple backgrounds who share the same perspective on the environment has fueled my passion potentially. The past few months of Fall quarter that I have worked as a CEB intern, I have not only learned to work directly with nature, but I also have learned to communicate science with others. Being a CEB intern is rewardingly gifted as this internship has helped me to explore my career goals through working with different local land mangers around Orange County and UCI faculty and scientists. This internship is certainly a remarkable college experience I could never forget. I definitely look forward to continuing to earn more knowledge and work experience in environmental conservation and ecological restoration for the remaining time that I have with CEB this year. I have always preferred being outside. It is this love for the environment that has driven me to pursue research in sustainability and restoration. 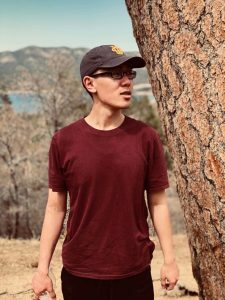 The Center for Environmental Biology internship has given me the opportunity to combine my two greatest passions, helping the environment and working with others. My goal in joining the CEB internship has been to learn about ecological research projects related to conservation and restoration in Orange County. Through this opportunity, I have learned to utilize my strong work ethic and communication skills to efficiently work with my peers conducting restoration projects. Surprisingly, working in the greenhouse on a restoration trait study has been my favorite experience so far. It has given me the opportunity to work both in a lab preparing seeds and in the greenhouse collecting data. I’ve learned so much about plant identification, vegetation sampling methods, and what a successful research project looks like. This experience has shown me how I can incorporate my passion for nature into my future career path after graduation. I have found that a simple love for the outdoors isn’t enough without action to preserve it. Through the Center for Environmental Biology (CEB) I have been able to express my passion for the environment while conserving it. Whether it’s raking plots and seeding native species, or drafting experiments for the field, I have learned the toiling efforts that comprise restoration. CEB strives to restore California’s degraded lands to the grasslands and shrublands that were once here. Already I have witnessed Orange County being restored. As a first-year intern I was a part of the development and implementation of an ongoing restoration project at Crystal Cove State Park. Now, as a second- year intern, I can see the results. A landscape once dominated by invasive mustard is now patched with native species like Encelia californica and Eschscholzia californica. CEB has set a precedent on how restoration should be approached: tactfully and patiently. I have come to understand that restoration doesn’t always go as planned; yet it always allows for something to be learned. I am looking forward to continuing my work with CEB and providing more service to Orange County’s beautiful lands. At a very young age I moved from Mexico to the United States, where I have lived at a farm ever since. Always being surrounded by animals, open land and people sparked my interest in science especially that which has to do with the environment. To me, science was a tool that gave me the opportunity to do what I am most passionate about, which includes helping people, animals, and nature. With the intern opportunity given to me by the Center For Environmental Biology, I have and continue to learn valuable skills related to research which include paying attention to detail, designing experiments, collecting and analyzing data, as well as working with people of different backgrounds and developing my public speaking skills. In the future, I see myself completing my undergrad and applying to a PhD program, which will hopefully help me obtain a career that I love. I also look forward to giving back to my community and other places around the world because underserved communities like mine seem to be the most affected by nature’s response when they are the ones who contribute least to the problem. In the end, I am grateful to have the opportunity to work with peers who share my passion for nature and make working on the projects a fun and memorable experience. I joined CEB hoping to learn more about the environment with hands on work. As time has passed, CEB has exceeded my expectations showing me everything I hoped to learn about the environment plus other skills including collecting plant density and soil moisture, water monitoring, leadership skills, research methods, public speaking, and more. I hope to be able to apply these skills in my future career. 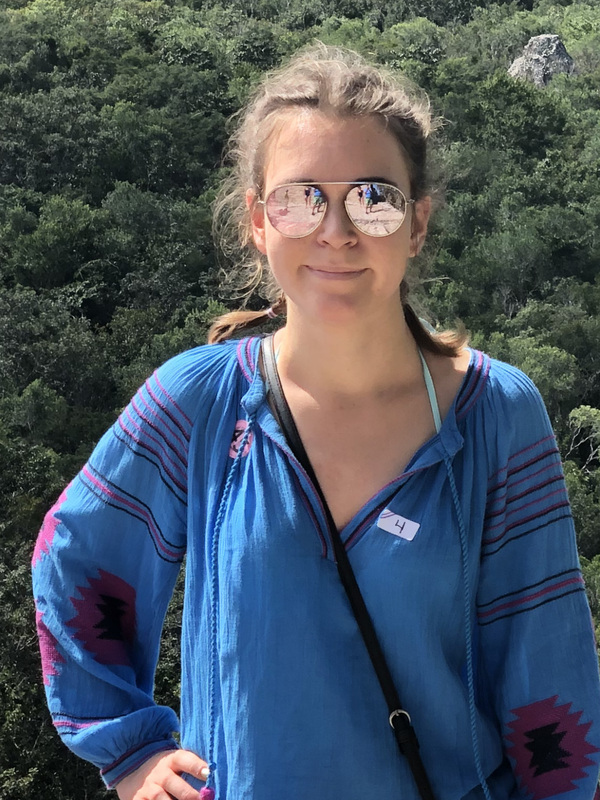 I was also able to explore many different fields of research and found my true passion, which is hydrology and water resources, by spending hours in a boat learning and teaching about water monitoring and marine diversity. I even had the opportunity to apply my acquired knowledge in my own ecological research project on Pond Turtle Monitoring at the San Joaquin Marsh through the Land Management Training Program. I am thankful to have been given the opportunity to be a part of CEB. Ever since I was little, I’ve always had a growing interest in the environment. The grandeur of it all, combined with complex connections created between the ground, the plants, and even the animals, never ceased to amaze me. 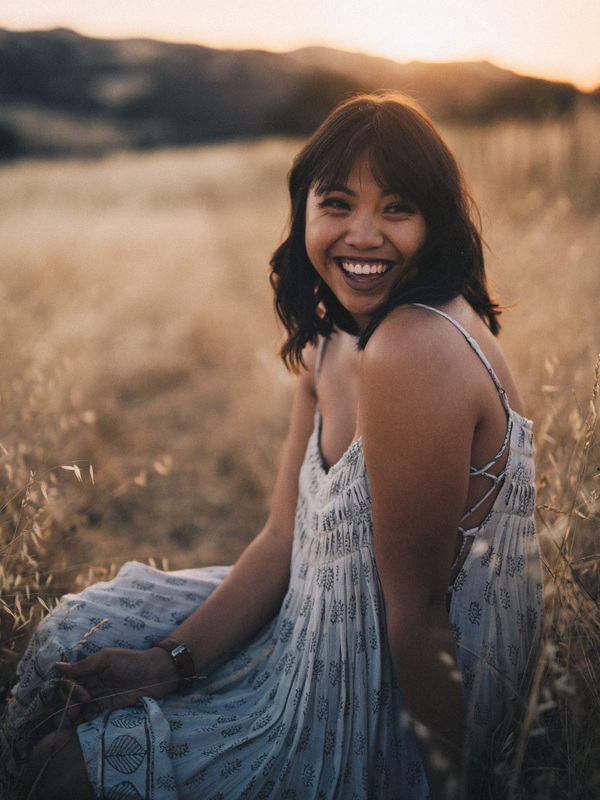 The Center for Environmental Biology has given me the opportunity to pursue this interest in hands-on fashion with an emphasis on field experience. I’ve participated in a variety of restoration projects, which have allowed me to partake in data collection, outreach programs, and experimental design. I’ve learned how to communicate the knowledge that I’ve gathered about the environment and apply it to other conservation projects across the UCI campus. 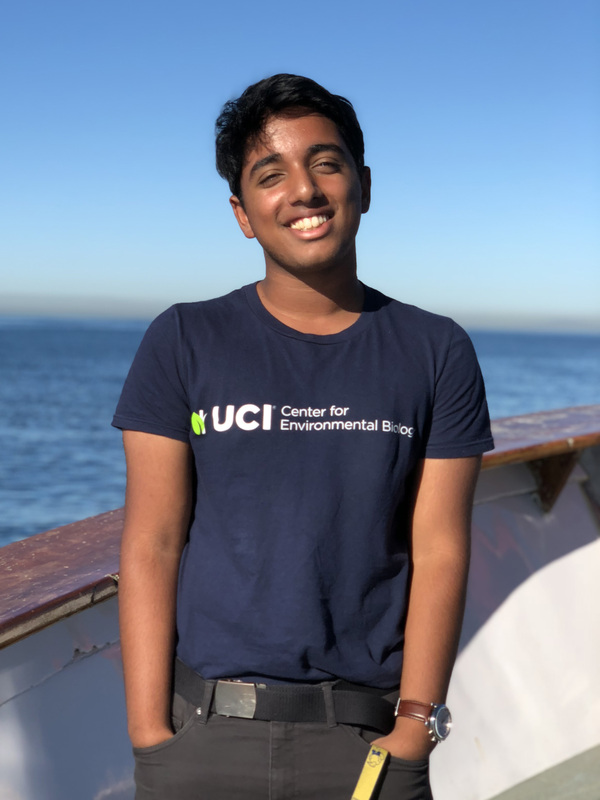 My favorite programs include working at the Back Bay Science Center and participating in a UCI Lands Management Training course, which will give me the opportunity to set up an animal monitoring project around the UCI campus for the next two quarters. In the future, I hope to apply these specialized set of skills learned through this internship in a professional field that combines my environmental interest with my passion for research. This internship has been an amazing experience and I look forward to participating in more projects to come.